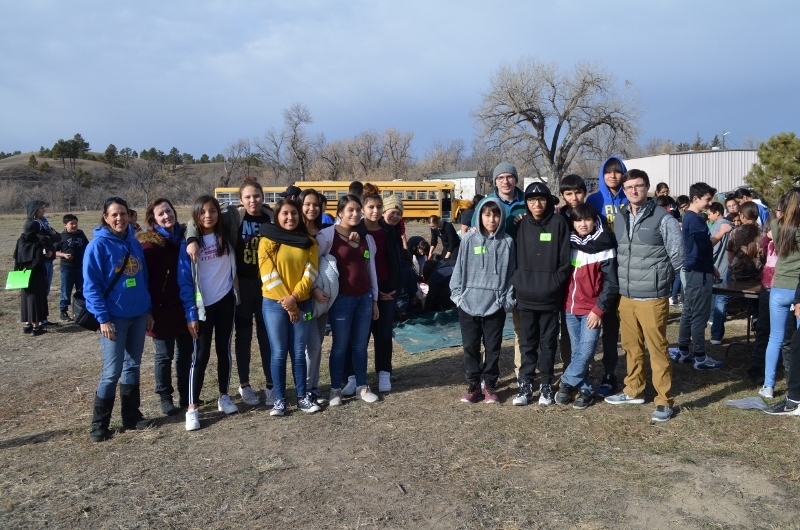 On a frigid fall morning, St. Joseph’s Indian School’s eighth grade students journeyed to the Pine Ridge Indian Reservation for an experience many had never had before: a sacred buffalo harvest. Taking part in a buffalo harvest is just one way students experience Lakota culture and spirituality through St. Joseph’s Native American Studies course. In this class, students learn about sacred Lakota ceremonies and Lakota language, as well as the beliefs and traditions of their Native American ancestors. Much of the learning takes place in the classroom. But students recently put their learning into action at the buffalo harvest, hosted by Red Cloud Indian School. 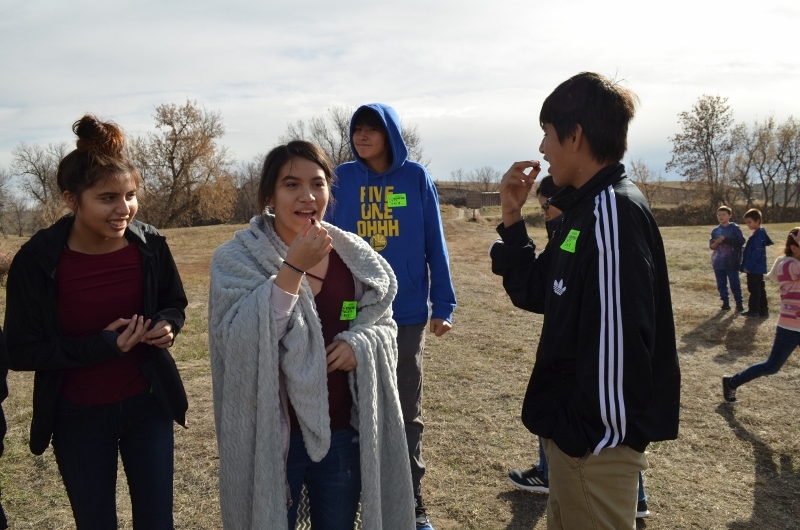 The students passed the time playing hand games, visiting the burial site of Chief Red Cloud, dancing and eagerly waiting for the hunter’s return with a tatanka — buffalo. “There was a chance there wasn’t going to be a buffalo because the buffalo has to present itself,” said Diamond, a St. Joseph’s student. But, as an answered prayer, a buffalo did present itself – offering itself as a sacrifice to the Lakota students. When the buffalo was brought to campus, everyone in attendance from children to adults circled around it. Before the process of separating the buffalo took place, they prayed in thankfulness. Then, adults explained what each part of the buffalo was and its purpose. The buffalo is a symbol of self-sacrifice. It gives until there is nothing left – right down to its bones and organs. When the buffalo’s liver was taken out, a piece of it was offered to everyone who wanted to taste it. St. Joseph’s students mustered their courage and tasted buffalo liver during the Buffalo Harvest! “The liver was said to be medicine,” said Diamond. As the harvest continued, the students learned more and more about the buffalo. Possibly the most important lesson of the day, students learned to model the buffalo in their own lives. This great animal gives completely of itself for others, which is a way of life that should be imitated – to be generous and give what you have to others in need. St. Joseph’s students enjoyed the buffalo harvest. “To be able to see that was once in a lifetime,” said Razelia. “It was fun because I have never gone to a buffalo hunt,” said Ivis. But now, Ivis and his classmates can say they have. And they can take that knowledge and experience with them for the rest of their lives – that’s something they are very grateful for. You are just amazing! I wish I would be rich so that I could give you all as much money as I could! What you all do with these children is just amazing and beyond words! Thank you for all you do! Thank you so much for your kind words, Laura! We are so blessed to be able to offer experiences like this for our students. Thank you for your wonderful sharing of the culture of the Lakotas. The account of the buffalo hunt and it’s thankful and prayerful process was amazing. Much to learn from here. Thank you, Mary! We are glad you enjoyed the story about this wonderful experience. A wonderful learning experience. Never to be forgotten. Thank you educators for your vision. I will always continue to support St. Joseph’s Indian School. I love seeing the students and the activities. I really like getting the letters and drawings from the younger children. God Bless you for all you do. Thank you so much, Susan! Your generosity is making a difference to the students in our care. We appreciate you! Not a bad idea, James! Thanks for the feedback. I love the letters and drawings from the little children their all sooo loveable and i will continue to keep supporting them as long as i can , it’s so wonderful what they do and may God bless each one. That makes us feel so good, Dianne! Thank you so much for the kind words. “Choctaw” & I am 1/4 “Cherokee”, so we have an infinity for the programs/children. Thank you for ALL you do for the students. Wish we could be MORE supportive, but being on a “fixed” income makes that difficult. Merry Christmas to you and the staff and ALL the LAKOTA children! Thank you very much for your support. Christ Tunpi — merry Christmas!